When I was thirteen, my great-aunt Elsie died. She left her house to my grandma. It was a large house with a downstairs. It sat on a large fenced-in piece of land. The last of its kind on Monaco Blvd. It was surrounded on two sides by apartment homes, but my great-aunt had refused to sell to developers. I remember exploring the house and the grounds. There was a mysterious workshop/garage that I was never allowed to go in, but I would peek through the dusty windows. There were all sorts of strange odds and ends in the shadows. I could just make out their shapes, but could never tell exactly what they were. I longed to go into the garage and explore, but I had to content myself with hiding under the grape vines under the large white trellis. When my grandma moved into the house, my mom and I decided that Grandma needed a watchdog. We adopted a small cur with strange yellow eyes. He seemed friendly when we met him, but we soon discovered his true nature when we gave him to Grandma. Grandma, of course, fell in love with him. She named him Tex and tied a red bandanna around his neck. He loved to chase the cars up and down the fence along Monaco, but could never figure out that he couldn’t catch them. He would race frantically along the fence barking ferociously. He also menaced any unfortunate pedestrians who happened to walk along the sidewalk on the other side of the fence. When Grandma took Tex to the vet, the vet took one look at him and declared him crazy. He told Grandma Tex should be put down, as he might prove to be dangerous. Tex never seemed dangerous to me. He was a little crazy. I had to be careful about leaving things (like my math book) where he could reach them. He once ate an entire page of math problems. I literally had to go to school the next day and tell my teacher that my dog ate my homework. And he was incredibly protective of Grandma. He didn’t like anyone going near her. One day Grandma was out working in the garden she had started in the front yard. She loved flowers and was planning on laying out a huge garden. She was bent over pulling up a weed when Tex noticed some pedestrians approaching the property. Barking wildly, he rushed along the fence to take care of them. Unfortunately, he did not notice my grandma bent over in front of him, and he knocked her down. She had injured her knee and couldn’t get up. She began calling for help. Luckily, one of the neighbors who lived in the apartment next door heard her and came to help. Tex wouldn’t let him near my grandma. Grandma tried to explain to Tex that it was all right, but Tex, ruff standing on end and lip curled, stood in front of Grandma and growled menacingly. Tex wouldn’t move when the paramedics came. My dad finally had to come get him. My grandma lay on the ground the whole time. I often have a clear sense of where I want to go, but I don’t know how to get there. My destination is clear, but I only have a vague set of directions. Take my novel. My beginning is clear. I know where I want to start. And I know where I want it to end. It’s the middle that confuses me. It remains blurry and indistinct. My life seems to echo my novel. How do I get from here to there? How do I meet all these goals I have set for myself? To find my way through the maze of my novel, I have been creating a blueprint, a map, that I can follow to get to the end. But I can’t seem to map out the rest of my life. But my path is not your path. You must soon go your own way. I must continue on the path I have chosen. Following the path you make for yourself. I just finished reading Life after Life, by Kate Atkinson. In the novel, the main character, Ursula, dies and repeats the same life over again. In one life, she lives only one second as she is strangled by her umbilical cord. In the next life, she is saved by the timely arrival of the doctor who was absent during her first birth. In each lifetime, she lives a little longer. Each time she returns, she brings back impressions from her previous lives that allow her to avoid the deaths she has experienced in her previous lives. This novel made me think. What would I do if I repeated my life? If a genie appeared before me right now and offered me the chance to relive my life, would I take it? I know there are mistakes I have made and things I have done that I would like to change or erase, but would changing these things alter my fundamental sense of self? What would I change? Would changing one thing change the course of my life? What if I never met my husband or never had my son? The risk of not having them in my life would be too great to contemplate. Of course, my life is as it stands. No genie is going to appear, so my mistakes are safe from correction. Everything I have done in my life, good or bad, has led me to this time or place. Every mistake has offered me an opportunity to learn and to grow as a person. Each one, no matter how mortifying, has made me who I am. One thing I am trying to remember in my 52nd year is that fretting about everything won’t make anything better. Last year, I spent endless days worrying about my job which I ended up losing anyway. All those tears and the sadness that darkened my days didn’t change things and ruined my time when I wasn’t at work. I am trying to learn to be a “glass is half full” kind of person, rather than looking at everything that is wrong all the time. Maybe, I can’t find a teaching job, but, on the bright side, I don’t have to deal with bratty kids or kids who don’t want to learn. I don’t have to go to work every day and face disrespect. Each day is mine to fill as I wish and I am trying to make the most of it-to fill my days with writing and to revel in finally being able to stay home with my son. Kischan Atriya is a man with a mission–get into Cityscape 87, clear out a warehouse full of Dissidents, and get out alive. He has one problem–his commanding officer is out to get him. 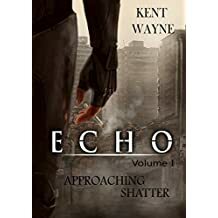 The main character of Echo Volume II: The Taste of Ashes by Kent Wayne lives in a brutal world where honor is usurped by political gain. Piss off the wrong person and a soldier could find himself facing the muzzle of a gun. Knowing that he’s as good as dead doesn’t keep Atriya from committing to the mission–but, if he’s going to die, he plans on taking a few of his enemies with him. The second in the Echo series, The Taste of Ashes begins with a vivid battle that seems to last forever, but, in fact, takes place in a day. A lot can change in a day, however, as Atriya finds himself facing insurmountable odds to survive. Wayne’s lyrical descriptions weave haunting images in the reader’s mind that are difficult to forget. Readers who have never been in the military experience a taste of what going into battle against all odds must be like. I have found the best way to crank up my creativity is to keep writing. I find that, when I take a break from writing, my creativity decreases. I need the daily routine of putting my ideas on paper to keep the ideas flowing. The more I write, the more ideas I seem to have. That seems counter intuitive, but I find that it is true. Usually, I write in the evening after my son has finished his tasks for his online school, after I have worked on my dissertation, and after my chores are done. Throughout the day, my mind will simmer as it prepares itself for the writing ahead. By the time, I sit down to write I find that the plot point I was worrying over usually works itself out or an idea will come for my blog or a journal entry. LIke exercise, the regular routine of writing keeps my brain agile. Sometimes, to disrupt my feelings of insecurity and fear, I need to step out of my comfort zone and do something different. Last year, around this time, I had just found out I was losing my job. I had been a teacher for 20 years, the last 15 years at the school where I was non-renewed. I was faced with uncertainty. What would I do now? I was going to apply for other teaching positions, but having been nonrenewed for performance, I knew that finding another job was going to be difficult. I had to think of alternatives. Teaching was not my passion. For me, it was just a job. What was my passion? I knew that I was happiest when I was writing. I had had a couple of pieces covered in small journals, but that was years ago. As I dealt with the increasing demands of teaching, my writing had gone to the wayside. But I still had ideas floating around in my head that refused to go away. Last year, I stepped out of my comfort zone and decided to look for ways to start a blog. That is how I found WordPress. Writing on WordPress helped give me hope that there were other things I could do with my life besides teaching. Writing was one of them. This year, I am going to step out of my comfort zone again. I am going to sign up for Christian Mihai’s program, From 0 to 5K in Six Months. I had the same fears I had when I started my blog. What if he doesn’t like what I write? What if I’m no good? I realized I had to step out of these comfortable fears that keep me from taking the risks I need to grow. A froth of emotions curdles my mind. Should I or shouldn’t I? What if I’m not good enough? What if they don’t like what I write? My writing stutters across the page. I know I need to step out of my comfort zone, but I am frozen behind a wall of fear. On Echo, an Earth colony in the distant future, the ruling class and its military fight a group of dissidents looking to overthrow the current regime. Despite the focus on military conflict, Wayne portrays the internal conflict of Kischan Atriya, a seasoned warrior. Atriya’s credo, “refuse to be weak,” has enabled him to attain a measure of success with the elite military unit, the Crusaders. Yet, with each achievement, Atriya continues to doubt his abilities. While the novel contains one brutal, but crucial, fight scene, there is little external action. The important events occur within Atriya’s own mind as he attempts to pin down the source of his doubt. The introspective hero is a refreshing change from other all-powerful protagonists featured in other dystopian series. Wayne has crafted a protagonist with insecurities that many readers might share. This novel presents a unique vision of Earth’s future. The writing is vivid. Wayne provides unexpected twists in the plot that keep the reader guessing.